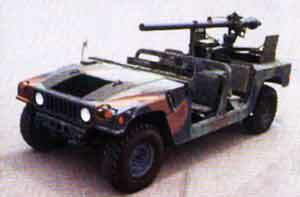 The High Mobility Multi-purpose Wheeled Vehicle (HMMWV) is the replacement vehicle for the M151 series jeeps. The HMMWV's mission is to provide a light tactical vehicle for command and control, special purpose shelter carriers, and special purpose weapons platforms throughout all areas of the modern battlefield. It is supported using the current logistics and maintenance structure established for Army wheeled vehicles. The HMMWV is equipped with a high performance diesel engine, automatic transmission and four wheel drive that is air transportable and droppable from a variety of aircraft. The HMMWV can be equipped with a self-recovery winch capable of up to 6000 pound 1:1 ratio line pull capacity and can support payloads from 2,500 - 4,400 pounds depending on the model. The HMMWV is produced in several configurations to support weapons systems; command and control systems; field ambulances; and ammunition, troop and general cargo transport. 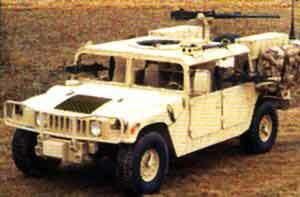 The HMMWV replaced selected M151 Jeeps (1/4-ton), the M274 Mule (1/2-ton), the M561 Gamma Goat (1 1/4-ton), the M718A1 ambulance, and the M792 ambulance. The High Mobility Multi-purpose Wheeled Vehicle is a light, highly mobile, diesel-powered, four-wheel-drive vehicle that uses a common 4,400 lb payload chassis. Using common components and kits, the HMMWV can be configured to become a troop carrier, armament carrier, S250 shelter carrier, ambulance, TOW missile carrier, and a Scout vehicle. The 4,400 lb variant was developed as the prime mover for the light howitzer, towed VULCAN system, and heavier shelter carriers. It is a tri-service program that also provides vehicles to satisfy Marine Corps and Air Force requirements. 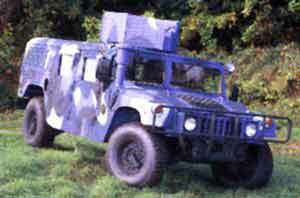 The HMMWV is the world standard in light military trucks. It is lightweight, high performance, four wheel drive, air transportable & droppable, land mobility system. The family includes utility/cargo, shelter carrier, armament carrier, ambulance, TOW missile carrier and scout-reconnaissance configuration. Payload varies by body style ranging from 1920 lbs on the 4 litter ambulance to 5300 lbs on limited availability Expanded Capacity variant, but is generally in the 5/4T range. A basic armor package is standard on the Armament and TOW missile carrier models. A more heavily armored, or Up-Armor HMMWV, is now being produced in limited quantities, primarily for the Scout Platoon application. 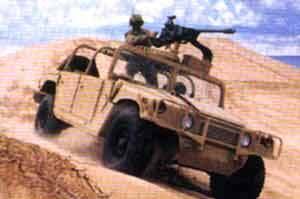 The M998 is the baseline vehicle for the M998 series of 1 1/4-ton trucks, which are known as the HMMWV vehicles. The HMMWV provides a variety of wheeled vehicle platforms. These are cargo/troop carrier, armament carrier, TOW missile system carrier, shelter carrier and two ambulance variants (2- and 4-litter). The HMMWV will also be the prime mover for the AN/TRC-170 Radio Digital Terminal and the Pedestal Mounted Stinger System. 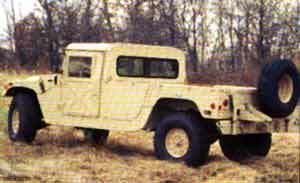 In February 1981, the U.S. Government invited proposals for a new High Mobility Multipurpose Wheeled Vehicle, and AM General was one of five companies that submitted proposals. AM General’s Technical Proposal included drawings depicting the design of AM General’ s proposed Humvee vehicle, including a grille design with nine vertical pill-capsule-shaped slots that were slightly taller than the round headlights that “bookended” the slots. 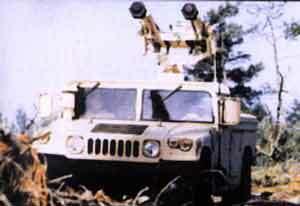 AM General was among three companies awarded “Phase I” contracts in July 1981; those contracts provided funding for production of prototype HMMWV vehicles for the U.S. military to test. 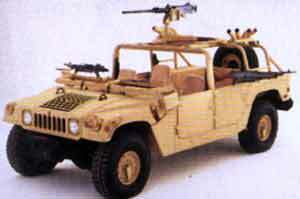 In March 1983, the government selected AM General to manufacture the HMMWV. 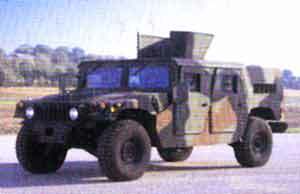 During the government’s testing of the Humvee prototypes, AM General engineers made various design modifications based on performance issues raised by the government; in one of those changes, the engineers moved the headlamps inboard and eliminated the two outer slots of the nine-slotted grille. 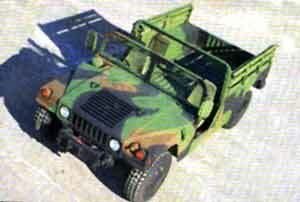 The Humvee’s seven-slotted grille first appeared in a blueprint completed in November 1982. American Motors sold its AM General stock and assets to LTV Corporation on July 24, 1983. Since the government’s 1983 acceptance of the final production version of the Humvee, every Humvee (apart from some 3,000 upper-armored vehicles) has employed the AM General engineers’ front grille design consisting of seven vertical slots. AM General sent production versions of the Humvee to the military in 1984 for more testing, but didn’t begin shipping Humvees to the military until March 1985. After being awarded a prototype contract in 1981, AM General was awarded a $1.2 billion contract to produce 55,000 Humvees over a five-year period (eventually increased to $1.6 billion to produce 70,000 Humvees). Also in 1983, LTV Corporation acquired AM General from American Motors, and established AM General as a wholly-owned subsidiary of the LTV Aerospace and Defense Company. 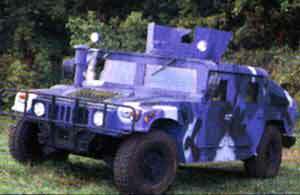 AM General was awarded contracts for the production of more Humvees in 1989 and 1994. Since its inception, the HMMWV has undergone numerous design and configuration updates and changes. These changes have included technological, environmental, operational, and safety improvements, such as higher payload capability, radial tires, 1994 Environmental Protection Agency emissions update, commercial bucket seats, three-point seat belts, four-speed transmissions, and, in some cases, turbo-charged engines and air conditioning. 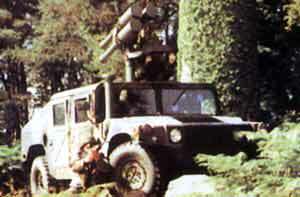 In 1995, the PM introduced the A2 configuration and the Expanded Capacity Vehicle (ECV) HMMWV. The A2 incorporates the four-speed, electronic transmission; the 6.5 liter diesel engine; and improvements in transportability. 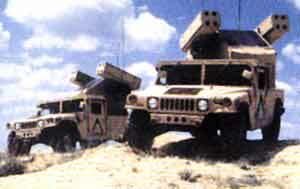 The A2 serves as a platform for other Army systems such as the ground-based common sensor. The ECV vehicle also went into production in 1995. The payload of this vehicle is 5,100 lb, including the crew. One of its missions is to serve as a chassis for the M1114 up-armored HMMWV that is used by the Scouts and MPs. The ECV also serves as a platform for mission payloads and for systems that exceed 4,400 lb. The most recent A2 variants going into production are the XM1151 Enhanced Armament Carrier and the XM1152 Enhanced Troop/Cargo/Shelter Carrier.